There are different types of columns. When you start with a new schedule it contains a couple of predefined columns most of which are text columns. For example in this image below the first column is named ‘Card’ (which refers to the "Card title" in, in this example, Trello) and is used to describe the nature of the activity, the second column is named ‘Labels’ and is used to indicate which labels are applied to that particular Trello card (again, a Trello specific example, this can be different if you use another integration). The start date column shows the start date of the time block or icon in the row. 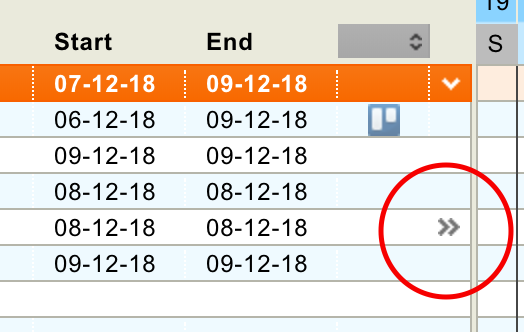 The end date column shows the end date of the time block or icon in the row. You can change the start or end date by just clicking on the date itself. The duration column shows the duration of the planned time blocks in the row itself on the left side and the total duration of a group on the right side. You can adjust the duration per row by clicking on the left part of this column but you can’t change the totals on the right side. These are calculated by the application. The icons column shows an icon of the integration you're using. These icons are direct deep links to the activity that is represented by that row, inside the integration. For example, if you have a Gantt chart for your Trello board, the icon can take you directly to that particular Trello card. 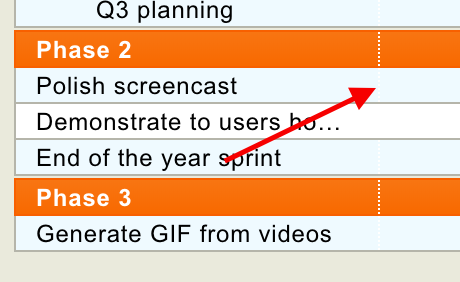 But for Basecamp Gantt charts, it can take you directly to a To-do list or calendar event. The last column in the row is what we call the navigation column. It has no header but when you hover over this column in a particular row that contains a time block or icon, it shows an arrow icon forward or backward which will take you directly to that date in the Gantt chart. Especially for larger projects, this can be really useful to navigate back and forth on the horizontal axis.